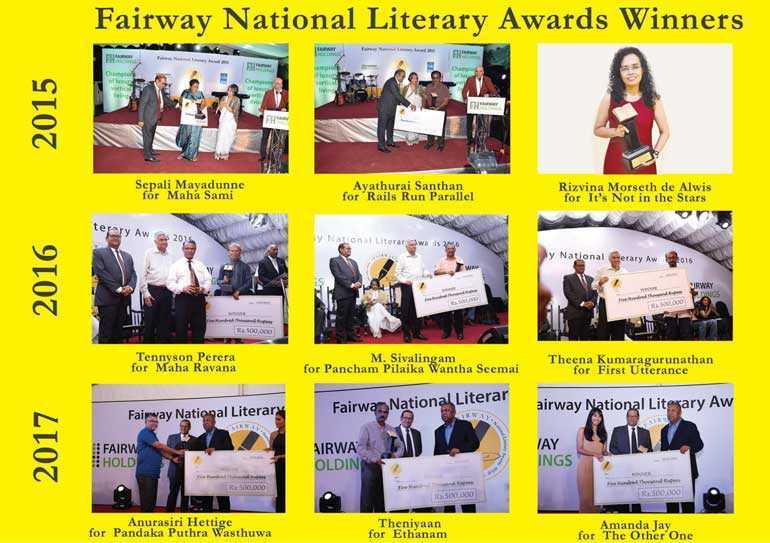 The Fairway National Literary Awards competition, now in its fourth consecutive year of operation, has fast grown to assume a leading role in the literary landscape of Sri Lanka. The call for entries for the FNLA 2018 was made recently. All novels in Sinhala, English and Tamil published for the first time and published in Sri Lanka from 1 June 2017 to 31 May 2018 are eligible for entry. The introduction of the FNLA by Fairway Holdings in 2015 coincided with the commencement of its sponsorship of the internationally acclaimed Fairway Galle Literary Festival. Fairway Holdings is strongly committed to promoting the arts and culture in Sri Lanka through various projects and initiatives with the underlying aim of creating a better, more humane society. The FNLA seeks to bring Sri Lankan literary creative excellence into the limelight by recognising and rewarding established writers and also encouraging and inspiring new writers. The publishers of the winning novels are also given due recognition. The response of the literary community in Sri Lanka to the FNLA has been very enthusiastic. The number of entries in all three language categories has increased considerably over the years and the announcement of the shortlists and the winners is eagerly awaited each year. The FNLA comprises cash awards of Rs. 500,000 each to the winners in each language category and cash awards of Rs. 100,000 each to the authors of all shortlisted novels. Submissions for this year will be accepted up to 25 July at the Fairway National Literary Awards Secretariat, ‘The Fairways’, 100, Buthgamuwa Road, Rajagiriya. (Telephone: 0775533121/0774462285).